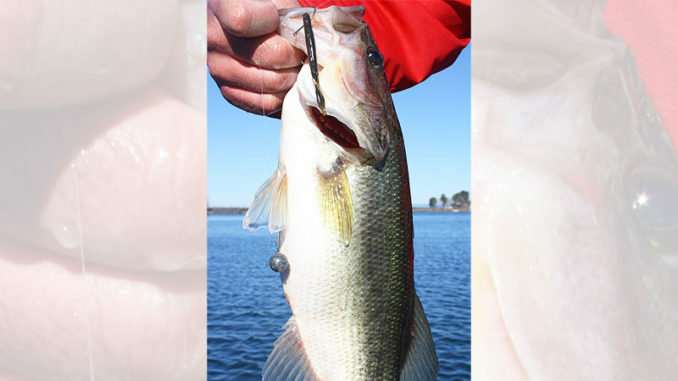 A drop-shot rig is a great way to catch winter bass on North Carolina’s Belews Lake. 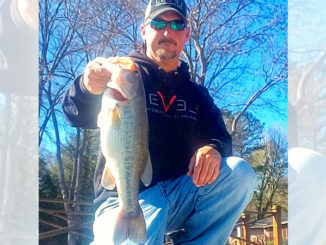 Joel Richardson of Kernersville, N.C., guides on a handful of reservoirs across North Carolina, but the one he knows most intimately is Belews Lake, the 3,863-acre fishing hole north of Winston-Salem and Greensboro, N.C.
Over the years, Richardson has seen the bass fishing at Belews peak, fall and rejuvenate. But it’s still a great winter destination because of the hot-water discharge related to the Duke Energy power plant on the lake. The influx of spotted bass has also changed things. Despite these changes, Richardson said Belews remains an excellent winter fishing hole. “You can catch spots and largemouth shallow and deep,” said Richardson, who defines shallow as 20 feet or less. Spinnerbaits, crankbaits, floating worms and shaky head jigs take fish from laydowns, shallow cover and long points. Richardson said most fish favor deep, open-water. 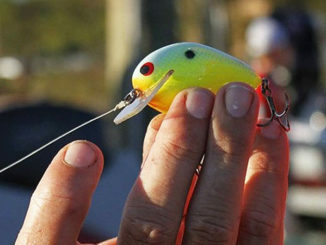 Anglers skilled with electronics “video-fish” for suspended bass by vertically dropping small jigs, spoons, tailspinners or drop-shot rigs in front of the fish after viewing them on their units. 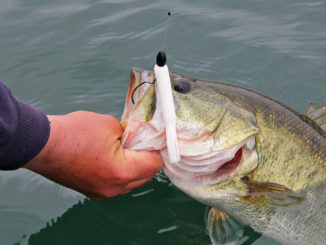 Spots run from 3/4 to 2 pounds; largemouth from 21/2 to 3 pounds. “Find the forage and you can catch 10 or more fish in a hurry; if you can’t find the forage, you can go hours without a bite,” said Richardson.